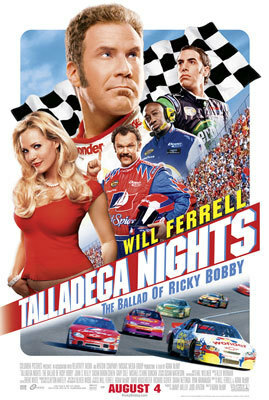 Talladega Nights: The Ballad of Ricky Bobby is a 2006 United States comedy film about NASCAR racing. The film is directed by Adam McKay, who co-wrote the film with Will Ferrell. The film stars Ferrell with John C. Reilly, Sacha Baron Cohen, Michael Clarke Duncan, Leslie Bibb, Amy Adams, Gary Cole and Jane Lynch. Various Saturday Night Live alumni also make appearances. Racetrack scenes at Texas Motor Speedway were shot at Lowe's Motor Speedway in Concord, North Carolina, using a Porsche Cayenne outfitted with camera mounts on all four corners of the car.